As promised, HMD Global finally launched its anticipated Nokia-branded Android smartphones in India. The first trio of smartphones, including the Nokia 3, Nokia 5 and Nokia 6, follows on the heels of the launch of Nokia 3310. These smartphones are priced at Rs 9,499, Rs 12,899 and Rs 14,999 respectively. The Nokia 3 will be available on June 16 across offline stores. The Nokia 5 will be up for pre-booking starting on June 7 and will be offline exclusive as well. The Nokia 6 will be Amazon exclusive and will be available starting July 14 with an introductory offer of Rs 1,000 discount. It is to be noted that the Nokia 3, Nokia 5 and Nokia 6 were all detailed at the Mobile World Congress earlier this year in Barcelona. While the Nokia 6 was launched even before the annual event, it is only now that the company has decided to make the smartphones available outside home country China. While the features and specifications of the smartphones is already known, here’s a quick recap. The most affordable of the trio, Nokia 3 boasts a unibody design but lacks a fingerprint sensor – something which has become a global industry standard. Nonetheless, there is a 5-inch HD display on the smartphone, and under the hood, MediaTek’s MT6737 quad-core SoC is clocked at 1.3GHz and paired with 2GB of RAM and 16GB of onboard storage. For photography, the Nokia 3 sports an 8-megapixel rear and front-facing camera. It is powered by a 2,650mAh battery. As for the software, the smartphone runs the newer Android Nougat out-of-the-box. Connectivity options include dual SIM support, Wi-Fi, Bluetooth and USB. The Nokia 3 will be available in Silver White, Matte Black, Tempered Blue and Copper White color choices. 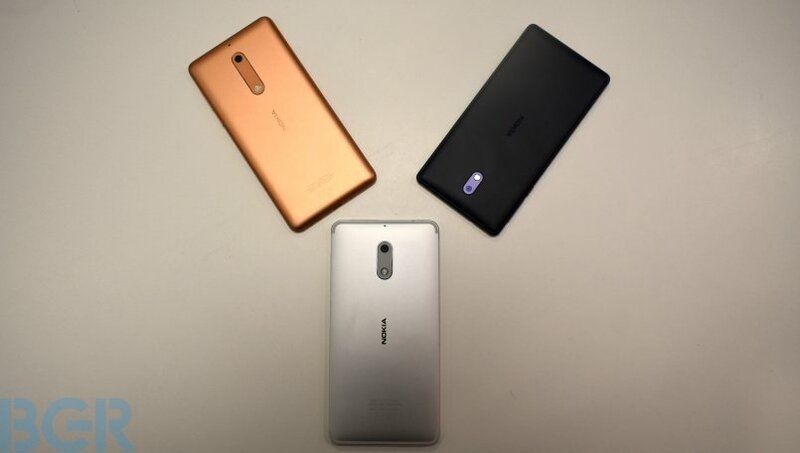 The Nokia 5 sits between the Nokia 3 and Nokia 6 in terms of pricing. It is also a unibody smartphone and features a 5.2-inch HD display. It is powered by Qualcomm’s Snapdragon 430 processor paired with 2GB of RAM and 16GB of internal storage. For photography, it is equipped with a 13-megapixel rear camera along with an 8-megapixel front camera. Keeping the smartphone ticking is a 3,000mAh battery. The Nokia 5 also runs Android 7.1.1 Nougat out-of-the-box. Connectivity options include Wi-Fi, Bluetooth and USB type C-port. The Nokia 5 will be available in Tempered Blue, Silver, Matte Black and Copper color choices. It features a 5.5-inch full HD display with 2.5D Gorilla Glass on top for protection. Under the hood, the Qualcomm Snapdragon 430 octa-core SoC is paired with 3GB of RAM and 32GB of internal storage. For photography, the smartphone packs a 16-megapixel rear camera and an 8-megapixel front camera. It is fuelled by a 3,000mAh battery and runs Android Nougat out-of-the-box. Connectivity options on the Nokia 6 include fingerprint sensor, Wi-Fi, Bluetooth and USB type C-port.